I thought I'd post some pictures of my new toys-- four yixing pots, a teeny gaiwan, some tea tools, and a cute little filter + panda holder. Be sure to click on the pictures for more detail, as usual. 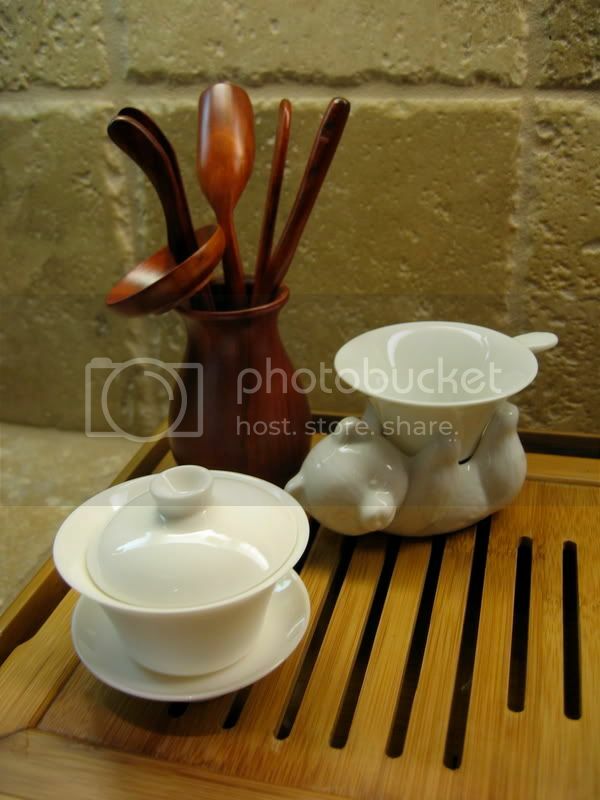 Here we have the tea tools (from Chinese Teapot Gallery), the ceramic/steel filter + panda holder (also from Chinese Teapot Gallery), and a white ceramic gaiwan (Yunnan Sourcing). 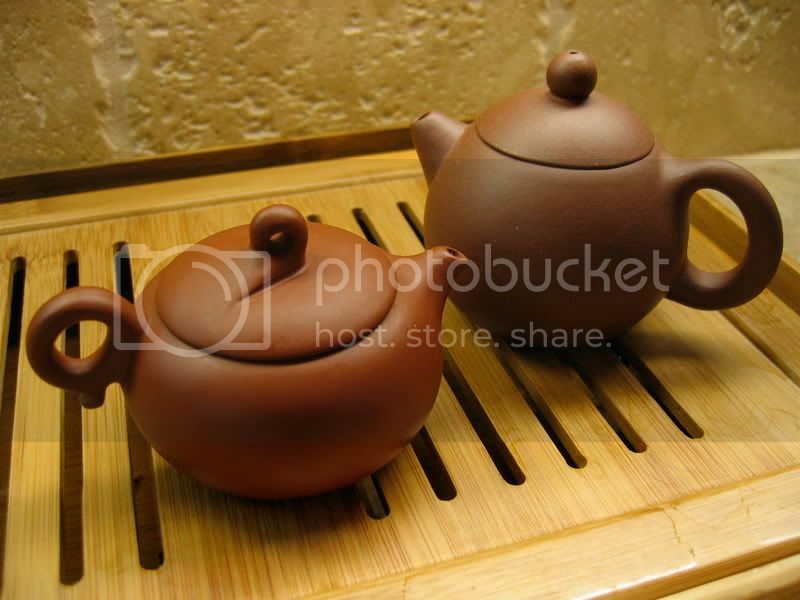 Though the gaiwan is listed as being 100mL, it's more like 50-60mL. Though I'm usually not a big fan of misinformation, I would much rather have a gaiwan this size than another one around 100mL, so I got lucky. 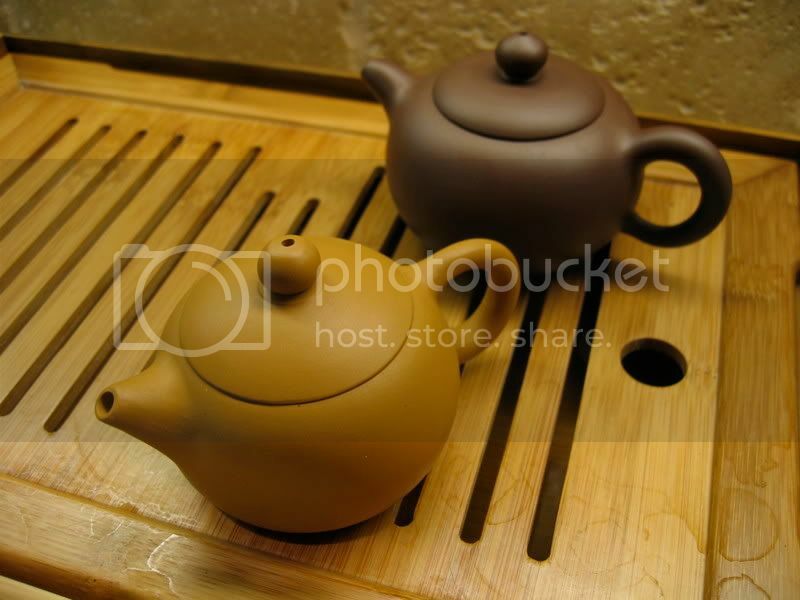 The tan-colored pot (Yunnan Sourcing) is about 120mL, and is being used for raw puerh; the darker brown/purple one (Mountain View Tea Village & Gallery) is 150mL and I've been using it for dancongs. The brown one in the background (Yunnan Sourcing) is about 120mL and is my shupu teapot; the red one in front (Chinese Teapot Gallery) is around 90mL-100mL, and is getting quite a bit of use as my Wuyi oolong teapot, though I'll probably use it for other darker oolongs as well. Oh, and a little note: For whatever reason I could not seem to format this post very well, so I hope it doesn't look mangled and deformed on your browser. my name is manuela...please send me a photo of your´ favorite cup.